Grevillea is a diverse genus of about 360 species of evergreen flowering plants in the protea family Proteaceae, native to rainforest and more open habitats in Australia, New Guinea, New Caledonia, Indonesia and Sulawesi. It was named in honour of Charles Francis Greville. The species range from prostrate shrubs less than 50 cm tall to trees 35 m tall. 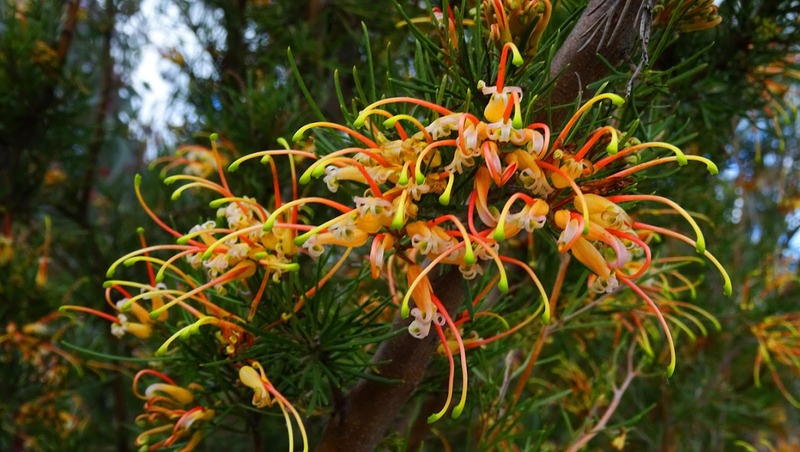 Common names include grevillea, spider flower, silky oak, bottle brush and toothbrush plant. Closely related to the genus Hakea, the genus gives its name to the subfamily Grevilleoideae. The brightly coloured, petal-less flowers consist of a calyx tube that splits into 4 lobes with long styles. They are good bird-attracting plants, honeyeaters in particular are common visitors. They are also used as food plants by the larvae of some Lepidoptera species including the Dryandra Moth.